What has brought Füssen more notoriety and what drew us there is that it is but a short trip from the famous fairy-tale-like Neuschwanstein castle. Bavaria is a state in the southernmost tip of Germany that is roughly the same size as Scotland. Much of the land is beautiful open countryside that in the winter months transforms from this lush green openness, to a vast stretch of snow. Deep in the South of Bavaria, at the foothills of a section of the Alps that separates Germany and Austria, lies a small town called Füssen. In it’s own right, this small town is quaint, peaceful and surrounded by natural beauty; however what lies next to it,is why we went so far from home. It seemed only fitting that we would choose to spend the week leading up to Christmas in such a festive and inspiring location. 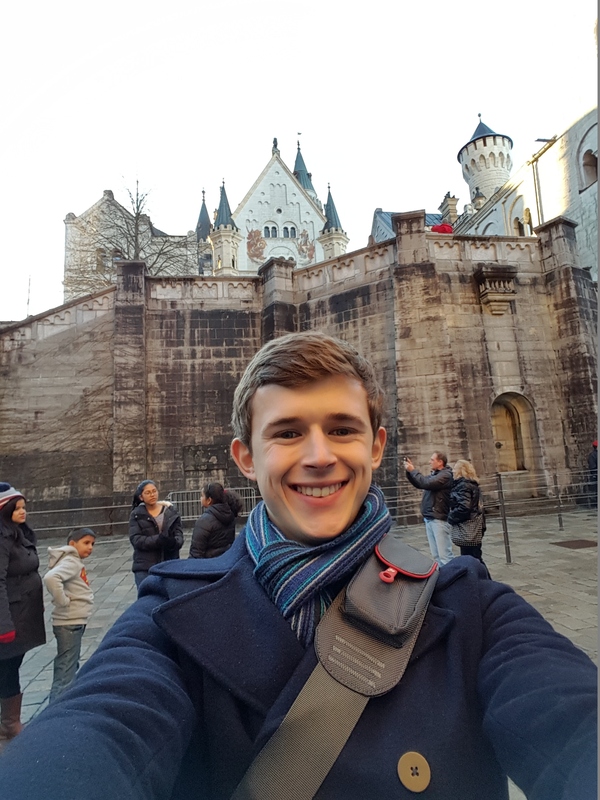 Here’s my best advice on how to visit Füssen. One of our aims with Bavaria was to make it as cheap and affordable as possible without sacrificing the quality of our stay. 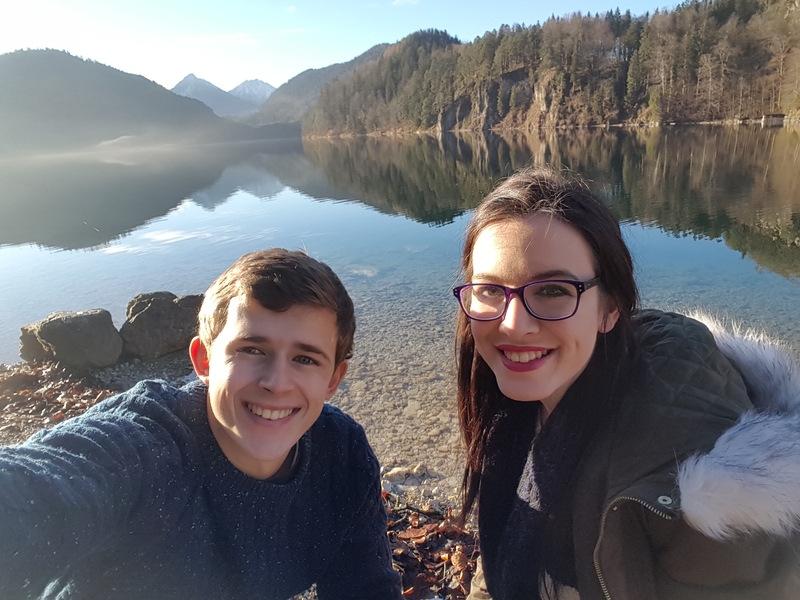 Luckily for me, Cazzy has always been a wiz at sorting holidays so I set her the challenge of finding a proper log cabin with a fireplace that was situated somewhere near Neuschwanstein castle and with superb views. I didn’t expect her to actually do it but she did! No word of a lie we stayed in the perfect little lodge and there was absolutely no catch. It was cheap (£60 a night), it had a fireplace in the front room, it had a Christmas tree, it had 2 floors and room for up to 7 people, it even had a sauna! A sauna!! You can check out a link to it here. The lady who owns it, Simone, is also such a lovely lady and so helpful with everything! Just be warned this place books up well in advance, and not surprisingly! The 2 closest airports you can take are Memmingen and Munich. I would dare say more people have heard of Munich because this is the capital of Bavaria and is a very large and built up city. We flew into Munich simply because flights were cheaper. They cost us just £80 per person for return tickets. We didn’t actually get to spend much time in Munich, but in the future if we get chance we would love to. From there we got a taxi ride to a local hotel where we got a cheap room for the night (our flights didn’t land until around 8pm). From there the next day we caught the bus to the local train station and caught the train all the way down to Füssen. This took around 2 and a half hours but what’s great is that the trains are all fairly modern and comfortable. We spent the time playing cards and taking time to admire the surrounding countryside. It really is a stunning landscape. This train ticket cost us 12 Euros each, and we paid the same on our return journey a week later. When you pay your city tax (around 3 euros a night per person depending on where you are staying), you actually get a free bus and train pass that covers the southern part of Bavaria. This was all we then needed for the rest of the trip. Of course I have to begin with this. It is arguably the world’s most famous castle and rightly so. It is the definition of a true fairy-tale castle, and was of course the inspiration for the castle in Disney’s Sleeping Beauty. The first time I came across Neuschwanstein was when I was in year 8. I have no idea how I came across it but nonetheless I did and I still remember the feeling of utter astonishment that anyone had actually built such a place. Not only is it the castle itself that is magnificent, but it’s also the scenery around it. Being built into the side of a mountain means it stands out proudly and at the same time offers the most amazing views from its balconies. King Ludwig who was the “mad King” responsible for its creation almost bankrupt the country in order to have it built! However now with up to 6000 people visiting it in just one day, it has more than paid for itself! But it’s no surprise so many people visit there. For this reason I would strongly recommend getting there as early as possible to buy a ticket from the ticket office that can be found on the hill up to the castle, and to also avoid busy weekends! TOP TIP: Horse and carriage: If you are with your partner then I would definitely recommend jumping on the horse and carriage up to the castle. It saves about a 40 minute steep uphill walk and in the snow it’s incredibly romantic. Unfortunately we weren’t lucky enough to get snow when we were there! 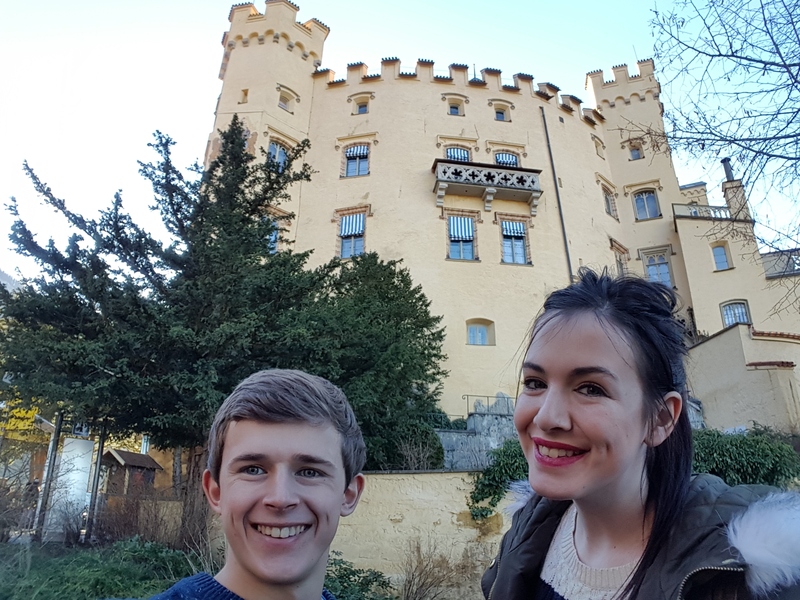 Apparently one castle isn’t enough for some people because King Ludwig actually owned 2! Hohenschwangau is situation below the mountainside to Neuschwanstein, and just behind the ticket office, you can’t miss it! This is where the King grew up as a boy and is still a very appealing castle in its own right. There is the opportunity to walk around it, but for the price we didn’t think it worthwhile as we knew it could never possibly stand up to its younger brother! Nonetheless it’s free to walk around its grounds and offers some lower-down but nonetheless breath-taking views of the river below it. This was possibly the biggest surprise for me for the trip and probably my second favourite experience from being there. If you take the bus a little further past Neuschwanstein castle you come to somewhere called the Tegelberg ski centre where they have a ski lodge. When we were there, the snow hadn’t arrived just yet so there weren’t any actual skiers there but either way, for 13 Euros you are able to hop on a ski lift that takes you all the way to the top of the mountain. It is hard to describe what it felt like staring off the top of that mountain hundreds of metre up in the air but was mesmerized. On one side you can see for miles and miles, a vast stretch of open green pastureland that is inhabited only by a few small settlements. And on the other side you look it out into the network of Alpine mountains that stretch off like some kind of white snow-capped maze. Me and Cazzy, being the mature adults we are took this opportunity to have a snowball fight that I soon finished. We then walked about 200 metres up the zig zag path until you find yourself even higher up and you are secluded on all 4 sides by gloriously magnificent peaks. It was like we became isolated in our own little winter paradise. As you can tell I absolutely adored this spot, and afterward we had a coffee and the ski resort on a table that stared off into the alps. 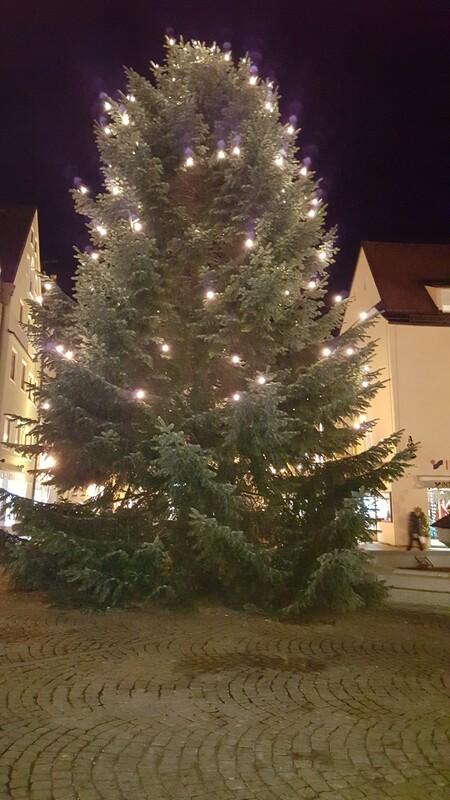 Do not miss this opportunity if you find yourself in Füssen. It was just mountains and snow everywhere! I loved this little market in the beautiful city of Kempten. We used our free travel card to take the train there and it took about an hour and a half each way. 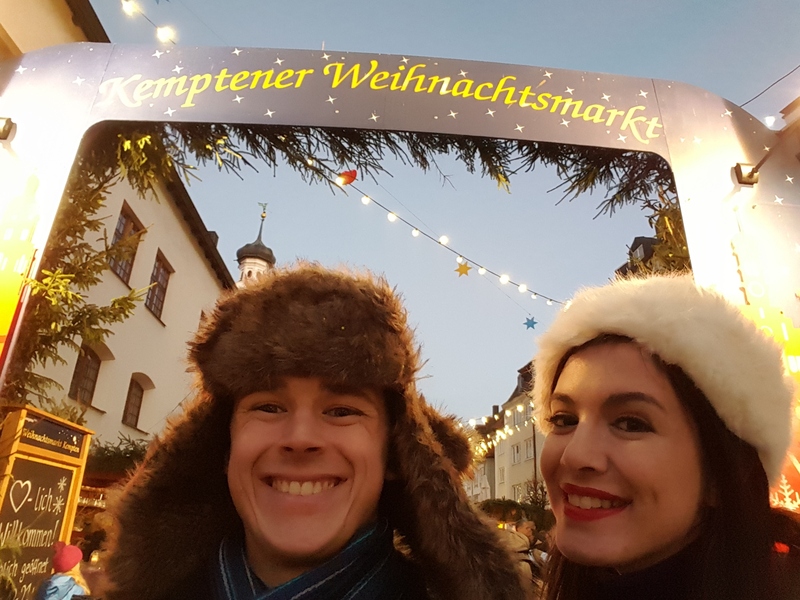 It was a chilly winter’s night, they had mulled wine, currywurst and music, not much more to say really, it was perfect! 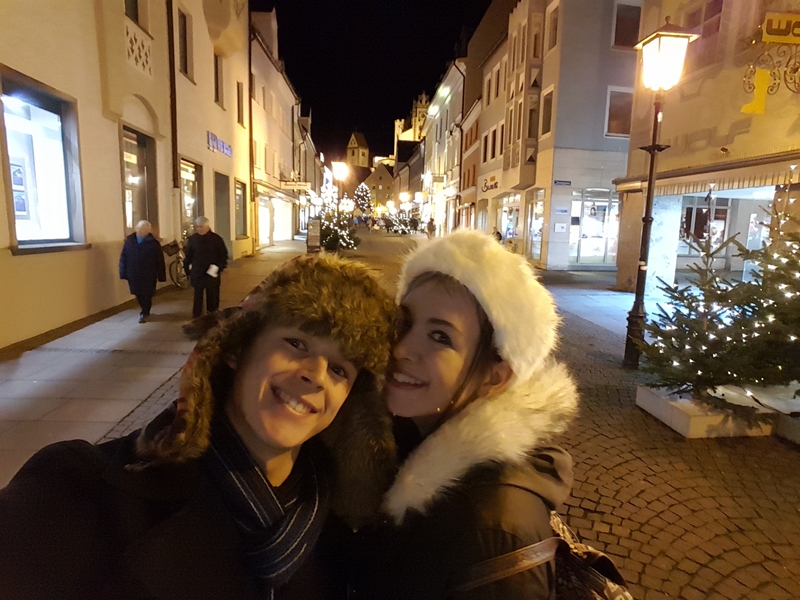 There are plenty of Christmas markets all across Bavaria at this time of year, and unfortunately the one in Füssen ended just a few days before we arrived. So if you’re there at Christmas time then be sure to check one out. Ok, we took too many selfies! I still remember the feeling of arriving at our log cabin. We had gone away seeking a proper winter retreat in amidst the snowy mountains and that’s exactly what we got. Everywhere around there are trails and paths that follow off into the valleys around the mountain. For us, you cross over a bridge to get to our log cabin and from this bridge the views are spectacular, it’s a river that runs off well into the distance with huge pine trees stretching off into the distance on the right, and the snowy mountains on the right. We would highly recommend this walk along the valley shoreline if you find yourself there. One thing we would have liked to have done, but we didn’t get chance, was to go visit a concentration camp, as we thought it would be very interesting to see. However we never got the chance as it would have been a full day out and every other day was jam packed with things to do. I have so much to say about this place having spent only a week there. If you fancy staying somewhere a bit warmer, maybe check out our Turin city guide next.